The Jewish festival of Shavuot (Hebrew: שבועות‎, lit. “Weeks”) is one of three main annual pilgrimage festivals in the Judaism. It commemorates God giving the Ten Commandments to Moses on Mount Sinai and it also celebrates the conclusion of the grain harvest in Israel. 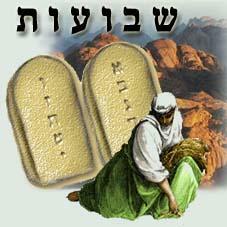 The date of Shavuot is directly linked to the celebration of the Jewish Passover. The grain harvest began with the harvesting of the barley during Passover and ended with the harvesting of the wheat at Shavuot. The time in between was seven weeks or fifty days. This time frame also represents the time between Israel’s Exodus from Egypt until the giving of the Law at Sinai. Pentecost is a major feast day of the Christian liturgical year. It is the Christian counterpart of Shavuot. The word Pentecost (Ancient Greek: Πεντηκοστή) means “the Fiftieth [day].” It occurs fifty days after Easter or Resurrection Sunday which roughly coincides with the Jewish festival of Shavuot. This is not coincidental. Just as Easter is the prophetic fulfillment of Passover, Pentecost is the prophetic fulfillment of Shavuot. The two feasts, Shavuot and Pentecost, have much in common, both historically and spiritually. Often Jewish participants would spend all night during Shavuot studying the Torah. They would read significant portions of the Torah aloud. This is what happens to us when the Holy Spirit comes upon us as it did on the Day of Pentecost for the early disciples. Jesus said that He came not to abolish the Law but to fulfill it (Matthew 5:17). It is the action of the Holy Spirit to bring us more into alignment with God’s Law. We cannot keep the Law by our own efforts, but we can yield to the Holy Spirit whom Jesus said would lead us into all truth and make alive His teachings. Pentecost is not simply a static day of celebration of the historical birth of the Christian Church. Surely it marked the beginning of the Church. As with Shavuot for the Jewish people, Pentecost is a time for us to reflect upon God’s Word, allowing the Spirit to renew our zeal for both the Law and the Gospel. The Season of Pentecost is the longest season of the liturgical year. The Sundays following Pentecost and extending up to the beginning of the new liturgical year in Advent are filled with readings concerning Christian growth. To live in Christ one must grow in the Faith. Spiritual stagnation could ultimately lead to spiritual death and a forsaking of God’s Holy Law. During the season after Pentecost, there are two tracks each week for Old Testament readings. Within each track, there is a Psalm chosen to accompany the particular lesson. Track 1 of Old Testament readings follows major stories and themes, read mostly continuously from week to week. In Year A we begin with Genesis, in Year B we hear some of the great monarchy narratives, and in Year C we read from the later prophets. Track 2 follows the Roman Catholic tradition of thematically pairing the Old Testament reading with the Gospel reading.